Well the hope was bed but now my sleeplessness is excitement instead of nervousness. 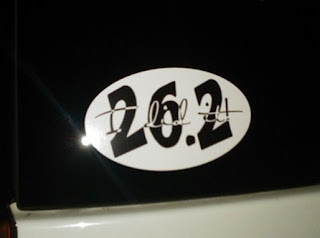 I just couldn't go to sleep knowing that my 26.2 sticker is just sitting in my house and not attached to my car. So as redneck as it is, I cleaned off a section of my window on my vehicle, my very dirty vehicle, to put up my sticker. Now maybe bed...maybe...who knows??? You know my sticker can't be like anyone else? It looks great on there! You deserve it.